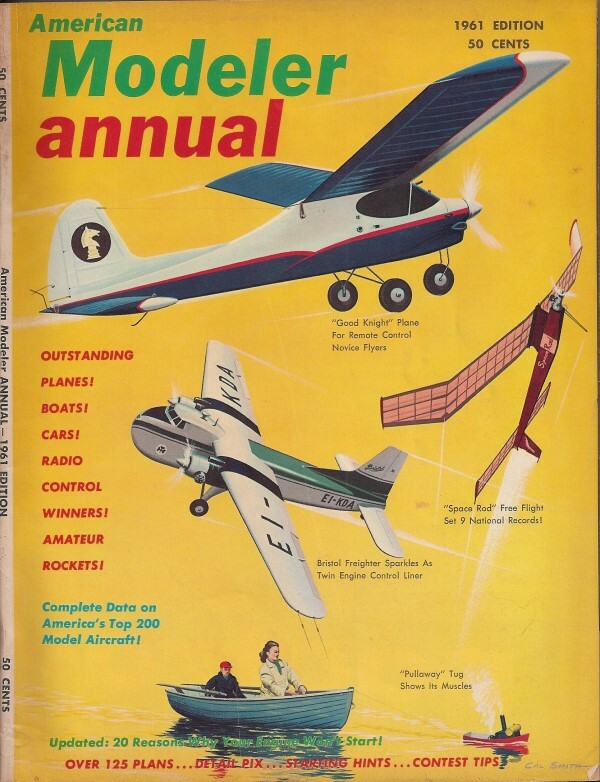 Website visitor Robert C. wrote to request that I post the article and plans for the British Bristol "170" Freighter that appeared in the 1961 Annual edition of American Modeler. This control line version has a 40" wingspan and is powered by a pair of .049s for scale-like flight characteristics or a pair .09s if you want aerobatics. Diesels are shown installed in the original. The fuselage, wing, and tails surfaces are all built-up and sheeted with balsa, so she is a sturdy bird. Britain's Bristol 170, a freight-and-passenger version of the Bristol Bombay bomber-transport, made its first flight in 1945. The 1954 version shown here, little altered from the earliest type, has seen service all over the world, building up a record for reliability and economy. 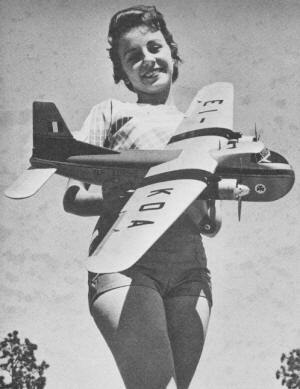 No glamour girl, the 170 is a flying machine par excellence, and our 40 inch version handles just like the big one. 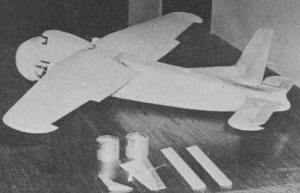 The straightforward engineering of the prototype is reflected in the easy construction of the model. The fixed gear offers an opportunity to build true scale without the necessity to fudge details of a retracting gear, and the constant-section elevator, low-slung circular nacelles and small window area are simpler to construct than most scale jobs. Powered by two .049's, the 170 performs smoothly on 40 foot lines; with a couple of .09's up front, you'll have to keep your head or you'll find yourself looping the dignified old lady. 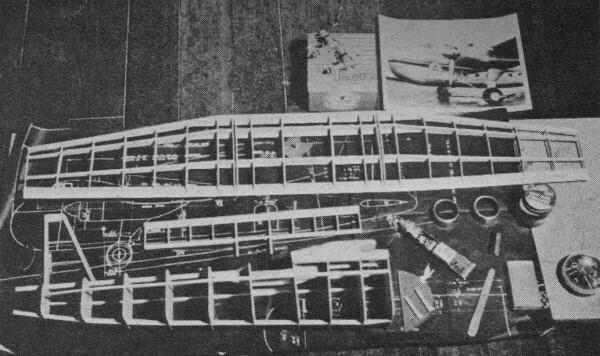 Construction of the 170 is all balsa, with the exception of a little wire and plywood; no difficult techniques are employed. The secret of turning out a beautiful job is to work slowly and carefully - and don't spare the sandpaper! Start by cutting out bulkheads 4 through 10 from 3/32" balsa, split them down the center. 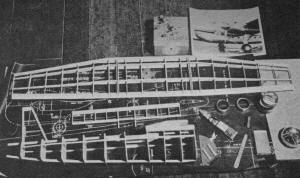 Layout 1/8 by 1/4 keels and part #14 on side view of fuselage. Add part 19 (1/8" balsa), and place one-half of each bulkhead in proper position, While cement sets up, cut two of part 20 and make up the two side stringers. Remove half-shell from plan and add other set of half bulkheads, place side stringers in notches. Be sure to align fuselage carefully at this point. Cut part 11 from 1/8 plywood and bind 1/16" piano wire tail wheel strut in place with #30 linen thread, and install. Part #13 fits between 10 and 11 and the gussets at the front against bulkhead 1 complete the basic frame. Start planking by cutting two side patterns from medium 3/32" balsa. Cement them first against bulkheads 1 through 7; when set, bend both in at same time and cement against bulkheads 8 through 11. Be sure to place these panels against flat portion of bulkhead sides. Cut top rear panel as shown on top view, cement in place. Bottom panel is identical except that it extends forward an additional 6-1/2". Complete planking using 3/32" square strips. Cut two of #12 from soft 1/4" balsa and cement in position to form cabin sides. Note that a left and right hand version of #12 is needed. Shape 1/4" balsa 7/8" by 3" to cross section shown on side view to form lower part of cabin and instrument panel. Cut rear section of cabin roof from 1/4" balsa and cement in place; bevel top as shown on side view, add front roof section. Cut part 22 from 1/8" balsa or plywood, add 1/2" soft balsa or white pine slabs to build up nose section. Cut tail fairing from soft balsa block and cement in position; then use a sharp knife or razor to trim all rough areas down. Finish shaping with a piece of #2 garnet paper wrapped around a small sanding block. Sand lightly so as not to cut too much; when shape is right, switch to successively finer grades of paper to work out a smooth finish. Seal surface with clear fuel-proof dope of the kind you intend to use for the final paint job, give fuselage a last going-over with 3/0 paper, and we'll move on to the wing. Use spar patterns to cut two of each spar from hard 1/16" balsa - don't cut the notches yet. Carefully score and bend the blank spars to angles shown on wing plan. Cut celluloid center layer for each spar, bend to fit, and using plenty of cement, laminate the two spars. Clothespins are handy at this point to hold the layers together while drying. Next, make up the leading edge, using medium 1/4" balsa. Carefully cut taper shown on wing front view and joint as shown on top view. Cut stiffeners from hard 1/16 balsa, cement leading edge stiffener in place; refer to rib pattern for positioning. Use spar patterns to mark positions of notches on spar assemblies. Cut notches with a sharp razor, or on a power band or jig saw. Cut ribs from hard 1/16" balsa, drill holes in one set for leadouts. Start wing assembly by cementing ribs on rear spar - be sure your notches are sufficiently deep so that ribs and spar are flush top and bottom. Fit front spar in place, add spar stiffeners and 1/16 by 1/4 strip near trailing edge. Cut panels of medium 1/16" balsa to exact size, and plank the underside of the wing, the center section and outer wing panels being covered separately. Give inside of wing a thorough coating of a 50-50 cement-dope mixture to strengthen joints and seal structure against moisture - which can cause wing planking to buckle. Install plywood panel for bellcrank, the leadout wires, and the 3/8" tapered strip against which ailerons will fit, shaping as shown on detail of wing section. Plank top of wing. (Use 50-50 mixture on underside of planking before installing). Cut tips from 3/8" medium balsa and cement in place. Shape leading edge and tips and sand out wing to smooth seamless finish. Apply a coat of clear dope, and sand, and we can move on to the tail assembly. Cut out parts R-1 through R-10. Join R-4 and R-10 to R-1, and place ribs R-2 and R-3. Add R-6 and R-7, and cut planking to exact shape shown on side view. Note that planking is fitted against rear face of R-7 and R-10. 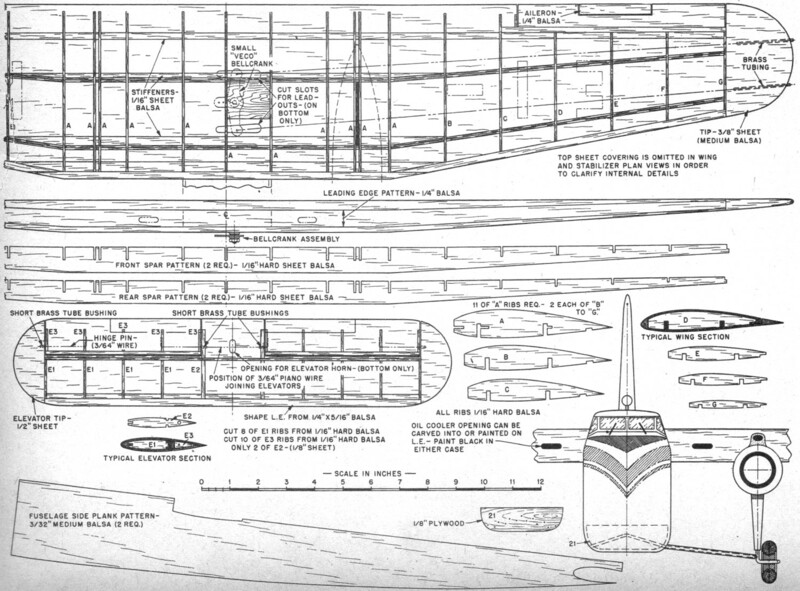 The movable rudder is built up by cementing the ribs against one of the 1/16" planking panels, cut to shape shown on side view, after which trailing edge is beveled and other side added. Cut slots to receive R-8 and R-9, which are cemented to fin after shaping. Rudder assembly can now be cemented to fuselage, and 1/2" balsa fairing block fitted in place under movable rudder and shaped. Assemble fixed portion of elevator over plan, plank underside, add tips. Build flippers, plank undersides and join with a piece of 3/64 piano wire bent to shape shown. Note elevator horn is formed by bending down an extension at center of this wire. The brass tube bushings must be slipped over the wire before final bends are made. Cement outer axle wires in place, cover elevators. Install them in the stabilizer, add top planking. Shape tips and leading edge, clear dope and sand. Cut nacelle profiles, part 19, from 1/8" plywood, bend and attach landing gear legs, using #30 linen thread, cement the bindings. 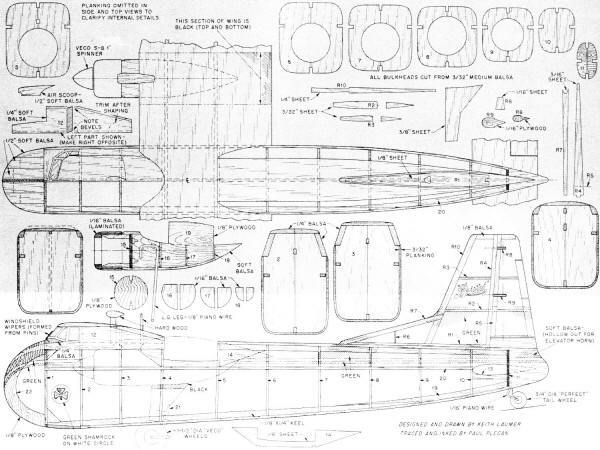 Cut firewalls from 1/8" plywood (use 3/16" ply for engines over .049 displacement); drill for engine mounting bolts, or notch for beams, to suit power used. Add firewalls and formers 16, 17 and 18. Cut slots in bottom wing covering to receive projecting tongues of parts 19, cement nacelle assemblies in place on wing. Secure mounting nuts in place behind firewalls or under beams, fuel-proof nacelle frames. Install tanks, if separate tanks are used, with left tank slightly larger. Use medium 3/32" square balsa to plank nacelles, fuel-proofing each strip before installing. Add soft blocks to complete rear contour of nacelles. Build cowls by using a form (a round bottle of the right size, or a piece of broom handle) and wrapping 1/16" sheet around it, beveling ends for a flush lap joint. Use two layers of balsa, and add two narrow strips at the front, inside, as shown on nacelle detail. Cut out an opening in each cowl after shaping to fit over cylinder heads. Carefully sand nacelles to a smooth contour and fuel-proof. Cut landing gear fairings to shape from 3/8" medium balsa, cut slots in leading edge of fairings to fit over L. G. legs, cement in place; then fill slots with 1/8" square. Next, bend supporting strut to shape, following half-pattern shown on front view. Note strut bends down at main leg, and around wheel on back side. Cut part 21 from 1/8" balsa and bind the strut to it, ready for installation. Install elevator by cutting away rear fairing block from the fuselage, together with bulkhead 11 and enough of the shell to allow elevator to fit into place. Then cut a notch in amputated tip of fuselage to receive trailing edge of elevator (use a length of hack-saw blade) and cement it back in place. Of course, the pushrod must be engaged in the elevator horn and installed together with the elevator. 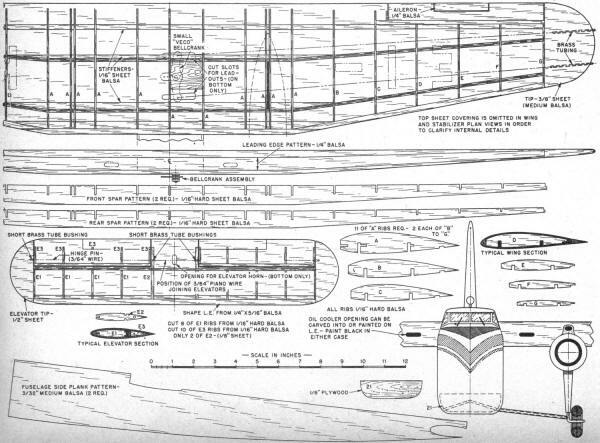 Trim away portion of wing forward of front spar, below leading edge stiffener, and between the two ribs A on either side of centerline of wing. Cut away enough of cabin sides (parts 12) to accommodate upper curve of wing. Tailor wing, behind rear spar, to fit over fuselage. When complete, mount bellcrank, engage push rod, and join wing to fuselage, checking alignment carefully. Cut slot in bottom of fuselage to receive part 21 with L. G. strut attached, and cement the assembly in place. Fill in slot with scrap balsa and sand smooth. Don't solder the struts together yet; wheels have to be installed first. Cut air intakes in wing leading edge. Check the "balance" of the model now. It should balance on the front spar. It may be necessary to drill a hole in nose section bottom and pack with modeling clay. Plug hole and sand smooth. Use Plastic Wood or balsa putty to fill in where needed, complete sanding of airplane as a unit. Spray a coat of grey auto body primer over entire model, sand out to a satin finish. Make radio antennae, ailerons, and airscoops, sand and prime, and install. The movable rudder can either be cemented in place, offset slightly to the right, or it can be mounted so as to be adjustable, by installing a wire axle pivoting in R-8 and R-9. When priming, filling, and sanding are complete to your satisfaction, spray a coat of fuel-proof aluminum lacquer or enamel over entire ship. Sand as needed, and repeat. Three well-sprayed coats should be enough. Tape off all except anti-glare panel in front of cabin, nacelles and top of landing gear legs and portion of wing indicated on plan, and spray black. Remove tape, mask all of model except decorative stripes along each side, including fuselage top rear (see plan and photos) and spray bright green. The lettering is cut from black Trim Film, and the shamrock insignia from white and green. Install 1-1/2" Veco wheels on main gear and Perfect 3/4" tail wheel, solder supporting struts to main gear. Paint inside of cabin black; cut pieces of 1/64" plastic for windows, one for front panels, and one for each side. Dope a small piece of stiff paper aluminum, and cut mullion strips to go between window panels. Make windshield wipers from pins and install. Notch out and splice 5.5/3 props to make scale 4-bladders, and dope aluminum. Add black edging; cut two more notches in Veco 1" spinners to fit them. Try your first flights on a calm day, over a paved surface. The 170 is a real floater in the glide, so here's your chance to perfect your scale take-offs and landings. Ease her off and settle her in on all three wheels. And remember - no loops.